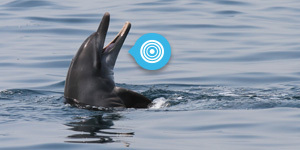 Identifying dolphins is not easy task, however if the individual presents some unique features this can help us to unequivocally recognise it, track its movements and define its home range. In dolphins the dorsal fin is the discriminant factor: with time it accumulates permanent notches and nicks which allow the identification of the individuals. The public can be of great help too in this process, as demonstrated by two recent sightings posted on the project website, where the reporters send us nice pictures and we were able to identify the same humpback dolphin individual. The first sighting was sent from Saadiyat Island by Alex at Bake Public Beach in early January and the second one form the area in front of the Emirates Palace, Abu Dhabi, by Luke from Wild Arabia a couple of months later. Conclusions? In general same dolphins individuals tend to stick together so it is feasible to assume that this group of humpback dolphins roam in the area between Saadiyat and Abu Dhabi. We have now concluded our humpback dolphin catalogue for Dubai waters but a we still have to receive a match for neighbouring areas. Would they go as far as Abu Dhabi? If you encounter dolphins please REPORT YOUR SIGHTING and if you can take pictures of the dorsal fins and send them to us!